Guess & Elle Announce Global Street Chic Finalist: Vote For Jena Gambaccini! Guess & Elle have partnered on a casting call to find a “Global Street Chic Ambassador” who will travel around the world taking pictures of the best in street fashion from global style hotspots. From hundreds of applicants, the finalists for the Guess & Elle Choice and Fan Favorite have been selected and are now posted on the Guess Facebook page. Visitors will have the opportunity to vote on their favorites and give feedback on the finalists’ looks. I was thrilled when I saw that one of the 16 finalists in Guess & Elle's "Global Street Chic Ambassador" competition was friend and fellow blogger Jena Gambaccini! Jena is the creator of the blog Chi City Fashion which highlights and covers fashion and street style in Chicago. I first met Jena in the press line for Mercedes-Benz Fashion Week Spring/Summer 2011. I knew we would be instant friends from the moment I saw her starring back at me from behind her Chloe sunglasses. I am SO PROUD of her and I would really appreciate it if all of my amazing guys and gals took TWO SECONDS out of your day to click two buttons to vote for her in this amazing contest. 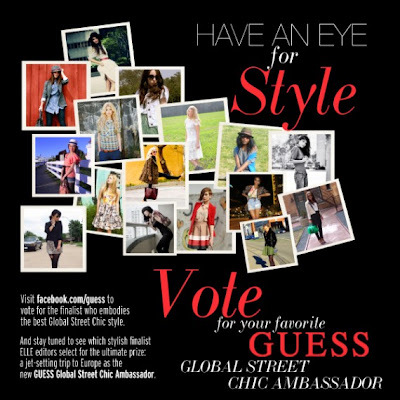 All you have to do is “like” the GUESS Facebook page, and then click vote under the picture of Jena Gambaccini in the Global Chic Contest tab. The final 8 will be announced June 14! Thanks so much for your help and congrats once again to Jena for doing huge things in 2011!! Above: The official flyer with info on the contest featuring the chic picture of Jena! Werk it Boo!